Color tracking is simple in teory, but hard to do in practice. It's all about finding the pixels that fit's the properties you are looking for. It's OpenSource as you might guessed. Now that's teory.. In the real-world, you got lightning, shadows, noise, and so on. But i hope you got the basic idea how to do color-tracking by now. Here's a demo video of the color-tracker in action. 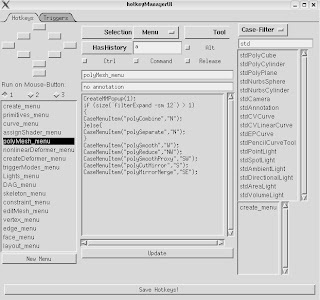 I'm using Qt as GUI, and a Pickle-Socket that sends the computed data to Maya in form of a dictionary. I use a Maya-Plane that represent my screen in 3D-space, so that it's easy to adjust the relationship between screen-space and 3d-space. The Maya-plane can have any number of reference-objects that are constrained to the 3d-model. The tracked objects will automaticly constrain to a reference object, when it get's close enough. I'll be working on a new pipeline for 3D-Animation this month as part of a school-project. This video shows me controlling a cube in Maya with candle-light using a wii-remote. It's created by using Python and pyBluez to connect to the wii-remote with bluetooth and bind it to Maya. Each Wiimote has an infrared-camera in it, and since candle-light emits infrared light, it's possible to track the motion of the candles. This could be extended to create a simple and cheep motion-capture device. A simple script that lets you go back in the history, and change earlier stages of a model.. The changes will be added to the object Construction-History. This might also be useful for when creating blendshapes.